Snake Oil is a miracle cure that will surely make your constitution strong. With added absinthe, you’ll be able to live for years! Let The Green Fairy soothe what ails you! Absinthe is a highly alcoholic solution and was used for medicinal purposes for many years. This candle takes classic absinthe scents and combines them into a cure-all candle for all your woes. The Snake Oil candle is aromatic blend of just the right combination of star anise, fennel, spicy cinnamon, cassia, nutmeg, and fresh green herbal notes with base notes of amber and woods. This transportive scent is poured into vintage green glass. The ethereal glow of the candle’s flicker through the green glass adds to the redolent ambiance. The Apothecary is a line of candles inspired by patent medicines of the 1800s. Without having any proof to their claims, charlatans and faux “doctors” were able to travel from town to town selling their snake oils, nostrums, and miracle cure-alls. When making these candles, I looked at the actual ingredients that were used in those miracle nostrums and used them in this line. These candles’ “miracle claims” are obviously made in jest, but the scents are reminiscent of the potions of yore. 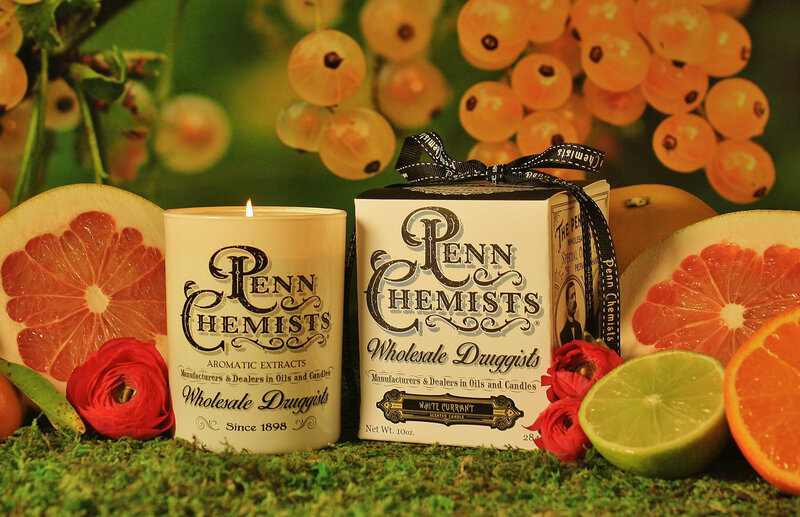 Pleasant aromas are the only genuine claims this alchemist will make! Soothing syrups were created with demulcent ingredients that were said to calm, comfort, and alleviate pain and inflammation. They were often marketed to mothers of colicky or teething babies. The Soothing Syrup candle is a blend of sweet golden honey combined with the nutty, slightly bitter scent of raw almond. This transportive scent is poured into vintage amber glass. The ethereal glow of the candle’s flicker through the amber glass adds to the redolent ambiance. Fragrant Heirloom Grapefruit and white Champagne Currant top notes are mingled with heart notes of tart Lime Zest and sweet Tangerine with a subtle bouquet of Jasmine and Tea Rose petals, finished with foot notes of clean White Musk and fresh Wet Woods. Includes gift ribbon and small box of matches.